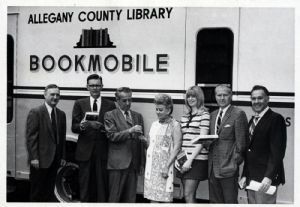 A second bookmobile was purchased with county funds in May, 1970 for $22,450, and replaced the first one in August, 1971. The Body, Model BFC 170, was manufactured by the Thomas F. Horoney Company, Inc. and has an International Harvester Chassis, Model 1603, Allison six-speed automatic transmission, is airconditioned, carpeted, and has a capacity of approximately 2000 books. Currently, the bookmobile has 58 scheduled winter stops and 75 in summer. One story hour for children is also given each week during the summer. There are 12,075 books in the bookmobile collection and circulation during the Fiscal Year 1978-79 was 82,104. Kathryn A. Porter is the Bookmobile Librarian. The Assistant Librarian is Jean M. Jackson, and Edith L. Hill is the Substitute Librarian. From the 1981 Annual Report.